Thailand Police have arrested two foreigners in possession 15 kg's of crystal meth (amphetamine). Again, stupid foreigners, doing stupid things, in a land that does not belong to them. More of these stories are cropping up every month in Thai news sources. This all needs to stop! On Thursday 29th October, a drugs and narcotics team swooped on the 2 foreigners and arrested them outside of the B Condominium in Bang Kaew. Six mobile phones were also seized. Great let's hope they catch the other vile foreigners involved. Police revealed that narcotics had been covered in black plastic and hidden inside 16 toy children cars. 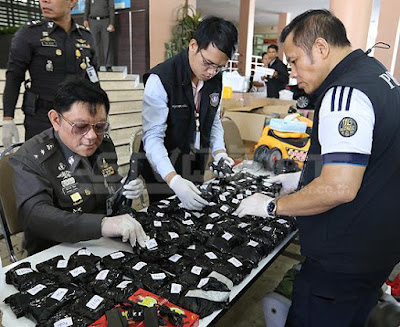 They made the arrests after somebody tipped them off that an African gang had been selling drugs to foreigners and tourists in BKK, Thailand. The pair remain in custody and are awaiting further legal proceedings. I hope they get sent down for many years to come, the rules are clearly stated as you arrive in the Land of Smiles, Thailand. Police are now trying to trace other members of the gang.